Sometimes you may need to tweak your form to add one or more fields. No problem! Just edit your form and go to the Fields tab. There, at the bottom right of the page, click the Add Fields button. That will automatically insert those new fields at the appropriate spot in your form (i.e. wherever you specified). Take a look at the screenshot to the right to see what the page looks like. 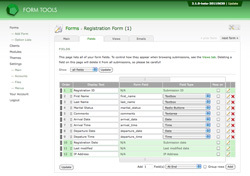 If you form is an external form, you'll need to add the fields to your form as well. 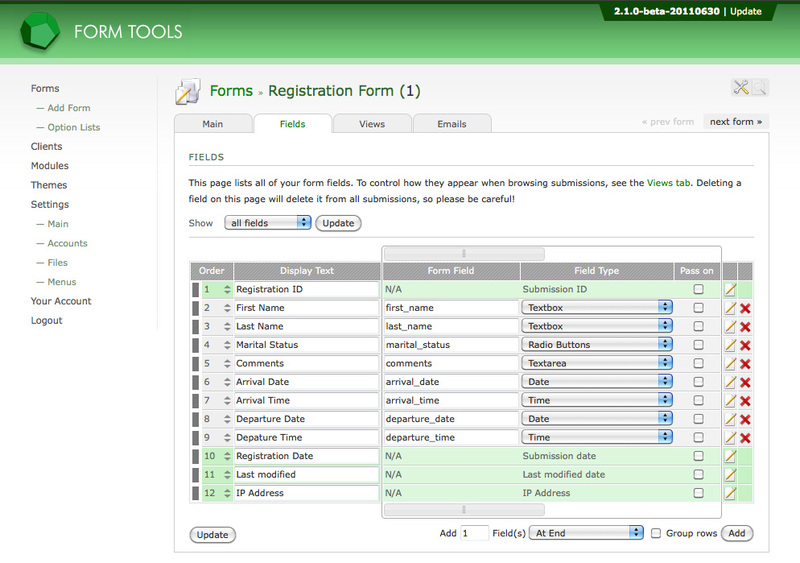 Make sure that the name attribute of the form is the same as what you've entered in the "field name" column. Another use for the add fields feature is to add fields only for use within the Form Tools UI. For example, if your form was keeping track of information about individual people, perhaps you'd want a "Comments" field where you could track private information about the person. You could do this by adding the field here, then assign the new field to one or more Views - perhaps one that's only accessible by you, the administrator.